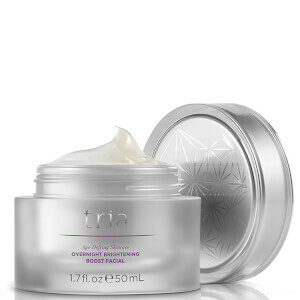 Reignite skin's radiance with Tria's Age Defying Skincare Overnight Brightening Boost Facial Mask, a specially formulated treatment that works to illuminate, hydrate and soften laser-treated skin. Designed to complement your laser treatment, the mask infuses skin with a host of brightening and moisturising ingredients post-laser; its blend of oil-based Vitamin C and Tria's own BrightEssence™ Concentrate work in synergy to counteract dullness, improve discolouration and replenish essential moisture. Its two forms of Hyaluronic Acid help skin retain moisture for a healthy, radiant complexion. Skin is protected from free radical attacks and deeply nourished. Use after your laser treatment. 86% of users experienced brighter skin. 91% reported skin looked softer and nourished. 82% reported revitalised and more luminous skin. Brush a thin layer on the face 1 to 2 times per week following laser treatment and Finishing Serum application.